Another Sinvention original design! Works perfectly with all our pony bridles or you can easily adapt it to your own. 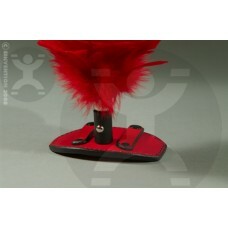 The padded base is comfortable on the head and features a screw mount to be used with one of our feather plumes. The base also features snap keeper straps for easy on/off with out taking apart your headstall to incorporate the piece. This piece of gear will fit on straps from 5/8" wide to 1 1/8" wide equally well. Does not include black leather plume base cover or red feather plume as shown (sold seperately).